The squad has had more time to relax and chill out during the build-up to the Croatia match and the girls have been taking advantage of it. Sometimes when we're on England trips the training pitches are half an hour's drive from the hotel and that takes up time. When you get back from training you have to do your recovery work and, usually, there isn't much of a chance to relax before dinner and meetings so with the hotel and training facilities all in one place this time around it's freed up some time. There's a games room, which has table tennis and a pool table, so there's been a few competitions going on and there's a cinema room, too. I've not played much pool yet as Rachel Brown is hogging that area. But I teamed up with fellow midfielder Fara Williams for table tennis and we beat Carly Telford and Rachel Williams - which they didn't take too well to. We'll have to put them on tea duty for the rest of the week as punishment! A lot of the squad were at the Olympics and although it's a different environment everyone seems happy. It's a massive game on Wednesday. If we win we know we'll have qualified for Euro 2013 and if we don't win we'll have to go through a gruelling play-off. In the past, when you've been involved in a big tournament like the Olympics, a World Cup or the Euros, there's a hangover period. You train really hard to get to the tournament and there's a come down when it's all over, but the tempo has been really good in training and it doesn't seem to have affected any of the players. The club season started straight after the Olympics so I suppose there hasn't been much time to reflect on what could have been. As Team GB we were obviously disappointed we didn't qualify beyond the quarter-finals, but there were a lot of positives to take from the tournament. We played against good quality competition for another four games and that will hopefully make us better players. 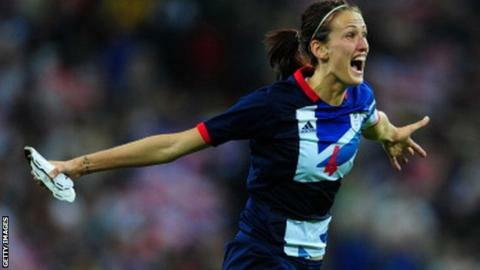 The Olympics definitely had a positive influence on women's football. For Everton's match against Liverpool there were 1,500 people at the game whereas before that we were getting about 300, but it's about sustaining it. It's fantastic that the qualifier against Croatia is being shown live on BBC Two and hopefully we can keep getting more television coverage. Once we start playing we won't be thinking "this is on television", but it's good people can watch at home and have an opinion on the game because usually you have to tell them what the score was. We beat Croatia 6-0 the last time we played them and we've had a number of meetings leading up to this match, watching footage of past games to see how we can exploit them. They're a hard working team, they never give up and like to put a challenge in, but if we are on our game we should win. We've done all the analysis - now we're ready to go!